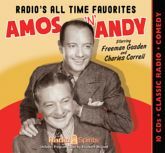 This career-spanning look at the work of radio's most influential team brings you ten full hours with Freeman Gosden and Charles Correll as AMOS 'N' ANDY! Amos Jones and Andy Brown symbolized the best and the worst of the average American - from their kindness and common sense to their self-importance and susceptibility to the lure of an easy buck. This collection features rare, uncirculated episodes from the team's early years all the way through to the 1950s. Experience the casual intimacy of radio drama and character comedy at their best. Includes a Program Guide by Correll and Gosden biographer Elizabeth McLeod! Note: Some of the rare episodes are of substandard audio quality. They are included here as the only surviving audio from these historic broadcasts.